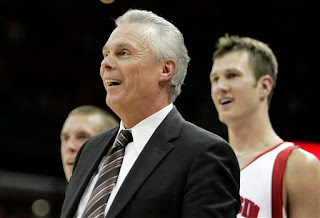 Good Weekend for College Hoops in Wisconsin ~ The Bucky Channel - The World of Sports from Wisconsin's Perspective. A couple of schools from the UW system met on the basketball court Saturday night, and it was the Wisconsin Badgers that prevailed. The Badgers cruised over the Phoenix from Wisconsin-Green Bay 77-57. In a related topic, I've always hated that UW-GB uses the Phoenix moniker. Don't know why, just have. Joe Krabbenhoft lead the Badgers with 15 points, while Marcus Landry and Jason Bohannon followed with 14 and 12, respectively. For the Phoenix, Somerset, Wisconsin's very own Mike Schachtner paved the way with 21 points. Camp Lambeau credits the Badgers work under the boards for the victory. Earlier in the day, the Marquette Golden Eagles were in action just down the Interstate. Lead by Jerel McNeal, they knocked off the Mastodons of IPFW 69-50. Now a nickname like the Mastodons, that's something I can get behind. Sorry Kevin, I don't have much more analysis for you. Just the box scores.